Hello! 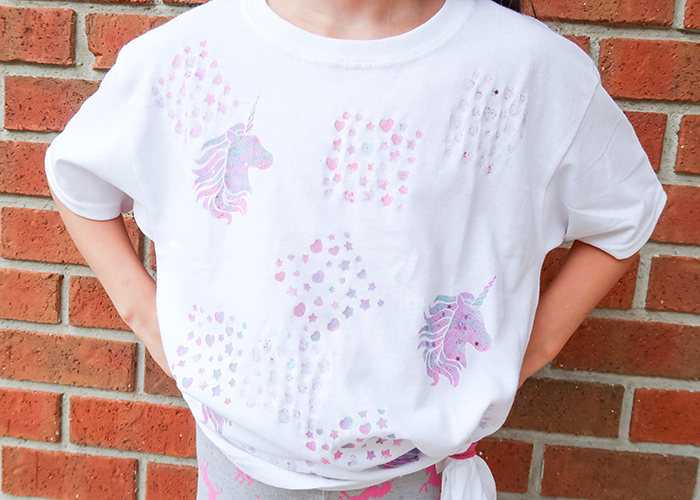 Today I’m sharing this Sparkly Unicorn T-Shirt Tutorial! 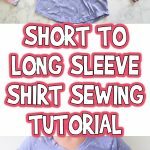 This is a great method for making inexpensive custom t-shirts for school or sports theme days, or for diy costumes. Here’s what you’ll need! 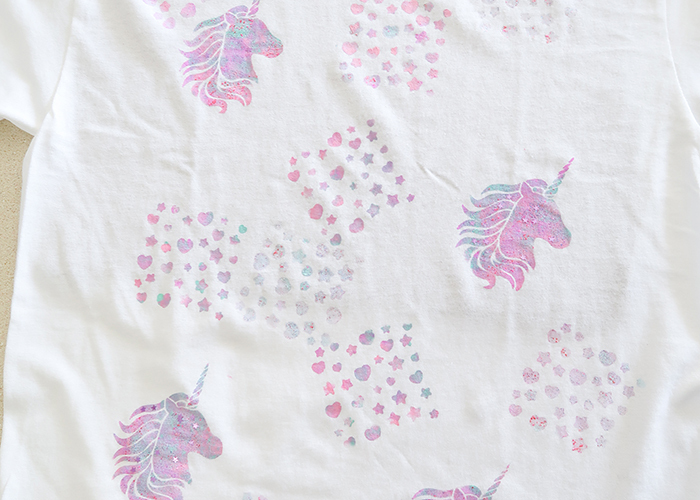 Check out our Unicorn coloring pages, too! Plain t-shirt. 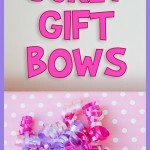 I get mine on sale at craft stores for around $2, but you can also find these at dollar stores. Cosmetic wedges. Very inexpensive in makeup aisle. Stencils. 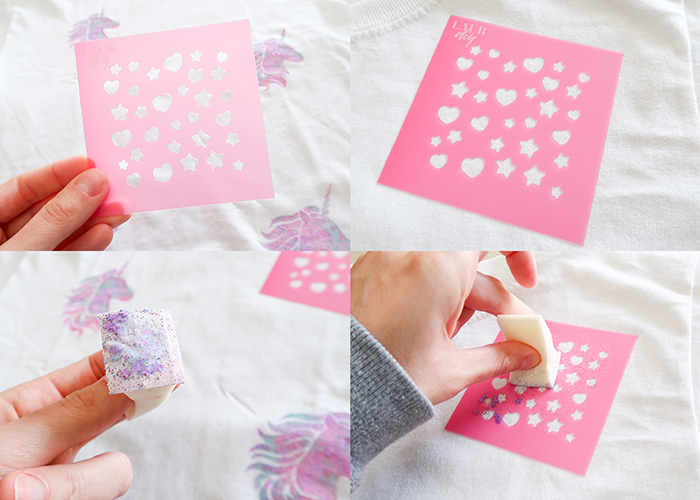 I like sticky reusable ones for working on fabric. Acrylic paint. I used blue, pink, and purple watercolor and pink and purple star glitter paints. 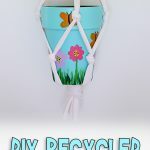 I prefer using the Martha Stewart brand because you can use it on fabric, and you don’t have to purchase expensive specialty fabric paint. Start by putting your piece of cardboard inside of your shirt. This helps keep the shirt flat as you’re working, and prevents the paint from seeping through to the back of the shirt. Put your main paint colors close to each other on your paint palette. 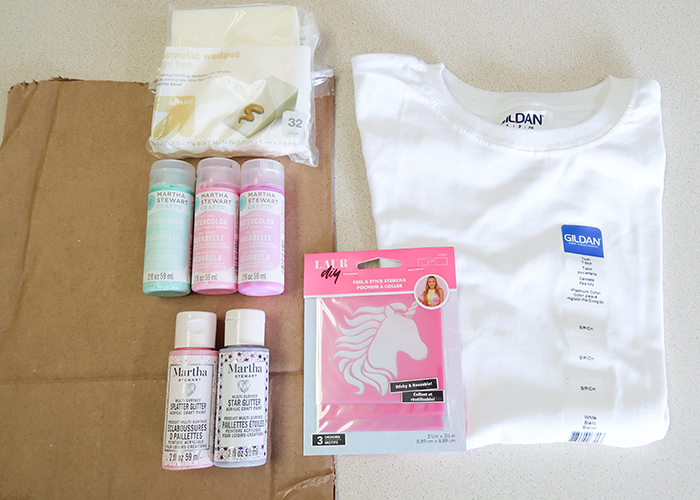 Take out your sticky stencil, remove the backing, and smooth it down onto your fabric. I highly recommend using sticky backed, rinsable stencils for working on fabric, especially for images with fine details. Take one of your makeup wedges and dip the big end into your main paint colors. You want them to start to blend together on the sponge. Now start stamping this onto your stencil. 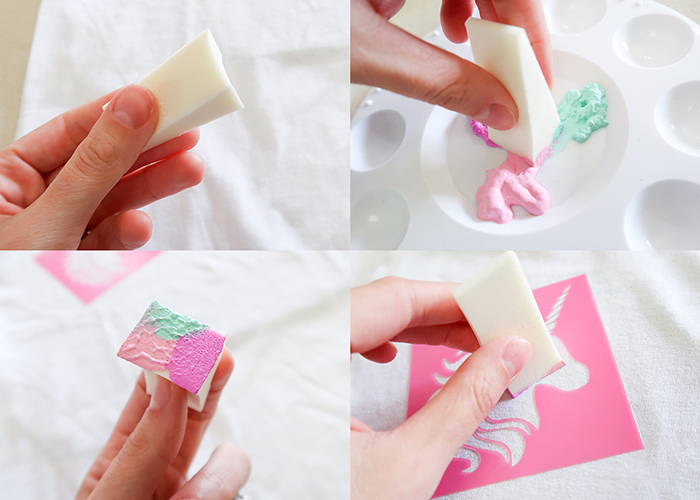 Add paint to your sponge as needed, and keep working until your stencil is completely filled in. Now add some of your glitters onto your palette. 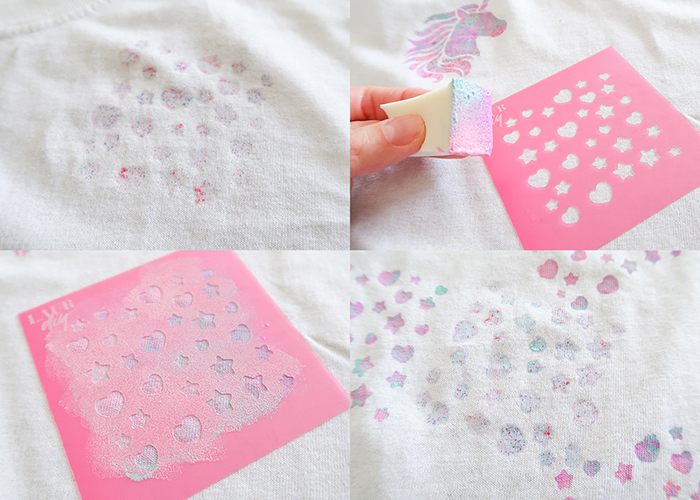 Using a different sponge for each color of glitter paint, start stamping on your glitter as well. 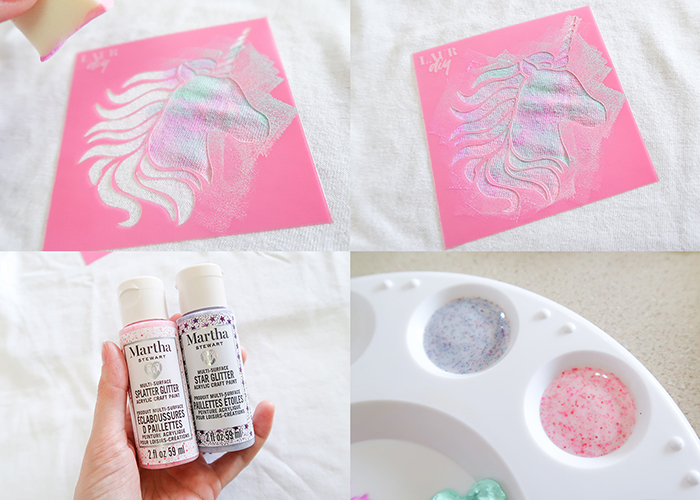 Glitter paint can be stubborn, so if yours has large particles like the stars in mine, you may need to use tweezers or your fingernail to slide those bigger pieces into the right place. 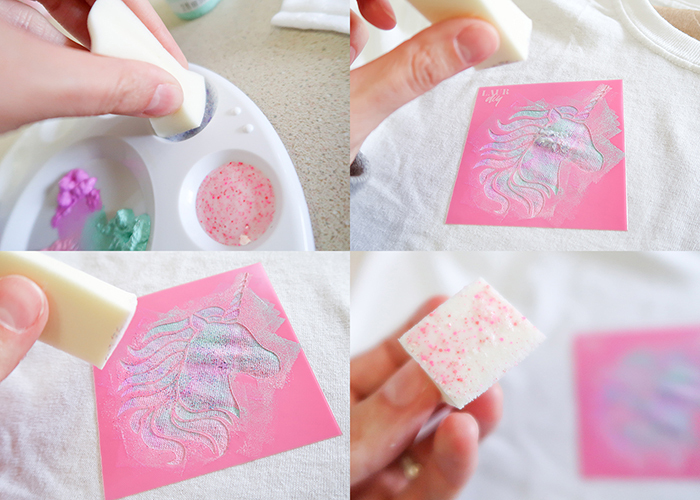 Before it dries, gently lift up the stencil… and you have your unicorn! 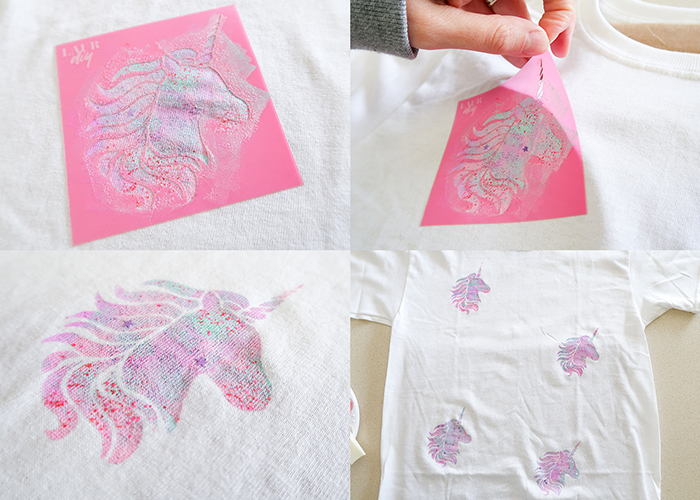 Now rinse your stencil and let it dry, and then make the rest of your unicorns that you want on the shirt. Let’s add some hearts and stars. 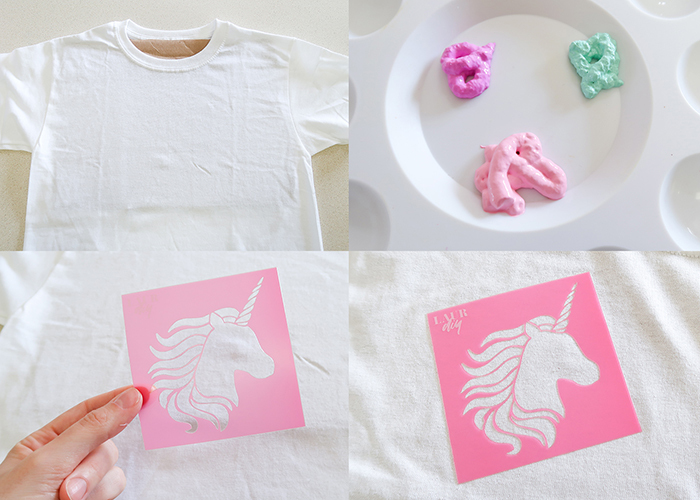 Apply your stencil the same way we did with the unicorn. Now I experimented a bit, and tried using just glitter paint for this part. 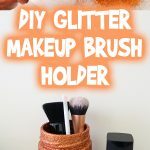 I found that it didn’t have a strong enough look, so I did some of them with all glitter, some with all paint, and some with a mix of glitter and paint. Those last ones were my favorite. Don’t be afraid to experiment and try new things! I let my shirt dry completely over night. 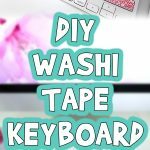 I would give it at least 2-3 days before washing, and I recommend hand washing or machine wash delicate cold and hang to dry for the best results. And when I showed it to my daughter I had a very, very happy 9 year old! Success! 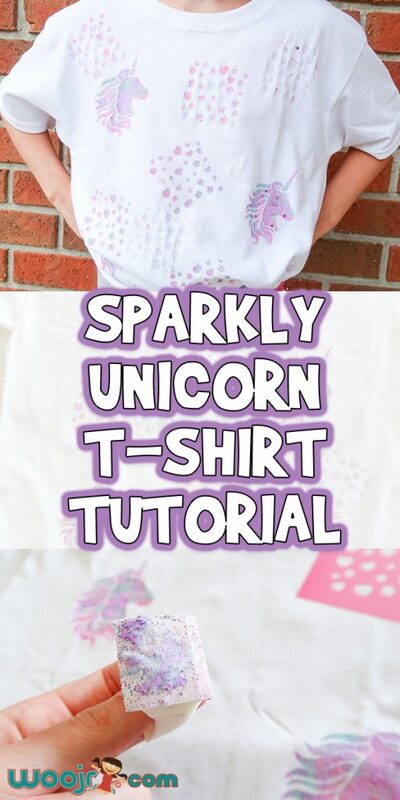 I hope you find this Sparkly Unicorn T-Shirt Tutorial helpful. 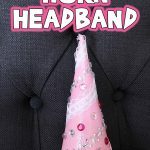 You can also use this method to add names to shirts as well!